Herencia Resources (LSE:HER) is a 'multi-commodity' development/mining company that is listed on the AIM market with 1.672 billion shares in issue and a market cap of £14.05m. It originally listed in February 2005. Herencia has two main projects each of which are located in Chile (which hosts a third of all copper production), Paguanta and Guamanga. In addition, Belgian global zinc smelting giant Nystar has a 10.1% stake in the company and Megeve Investments has a 2.4% stake. Herencia is an interesting prospect which has suffered share price wise in recent months. As shown via the chart above, Herencia is a very volatile share with the share price ranging between 0.76p and 2.53p in the last year alone, currently standing at 0.81p as shown. Following excellent price movement in 2011, Herencia has been drifting downwards and has had a very poor 2012 so far with the share price falling well over 50%. Despite this, it looks like it's ready to make its next move up which will probably be a gradual increase should the wider market allow. All other details on the price movement can be found in the chart. Positively, Herencia has zero debt to date. Herencia's principle asset is known as Paguanta. It comprises a 39km2 zone that spans across 3 separate projects. These are 'Patricia', 'Doris' and 'La Rosa' which are zinc-lead-silver-gold (of which gold is in low quantities), copper-silver and porphyry-copper prospects respectively. Initial results from Patricia were wholly positive with 80% of holes drilled recovering mineralisation of which 40% returned high grade zinc-silver-lead samples. To date, circa 90% of wells drilled at Patricia have now been successful. (Porphyry is copper deposits found within igneous rocks). Patricia is said to have open pit potential due to finds being fairly close to the surface which would be beneficial to the company through lower operating costs, greater ore recovery, selective control of recovered grades and early access to ores of which some of the highest grades are near the surface. Patricia is quite possible the consistent asset of the company, with the entire area so far determined fitting well inside the lease zone with only a small part of it tested so far. WH Ireland has given NPV (at a 10% discount) values to Patricia in upwards of £34.6m - significantly higher than the current share price. Potentials for Patricia stand at $120.9m on a 60:40 split basis also. However, values are affected hugely by changes in base metal/precious metal prices hence it is difficult to place a firm estimate. 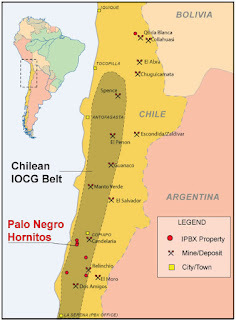 Substantial positive sensitivity to any potential increase in tonnage and grade"
The La Rosa area (within Paguanta) is also very prospective and is embedded in an area containing cretaceous andesite volcanics that is in a geologically short distance from other major finds from super-majors such as BHP Billiton, Anglo American and Xstrata. The Doris zone spans 3x1 km with 'mineralised structures between 0.5-10m wide'. The Guamanga project (11.2km2) has also encountered high grade copper/gold readings which can be found via Herencia's website .The Guamanga project is found 60km north of the city of Copiapo and lies within the Atacama Desert. Due to the desert conditions, drilling is rarely interrupted. 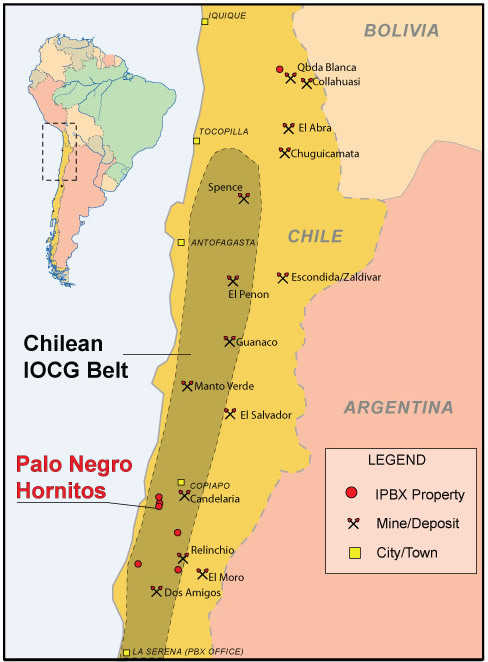 Through map overlays it is also possible for the Guamanga project to be located within the extremely prospective Chilean IOCG (iron oxide-copper-gold) belt. Should this be the case, the potential for a very large discovery worth multiples of the current market cap is certainly possible. However, this would need to be confirmed before it can be accepted. 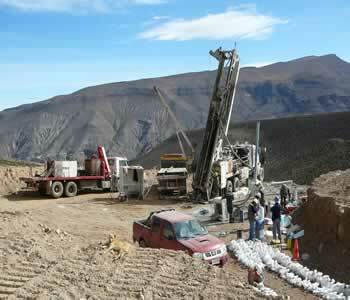 The La Serena project provides relatively unexplored upside. La Serena area is found close to the coast on the West side of Chile. Existing projects from other firms exist in the region demonstrating clear potential for mineral finds in Herencia's licenses. La Serena also benefits from low cost terrain due to its lower altitude and proximity to existing infrastructure. Herencia has a 70% stake in the Paguanta project, 51% earning from the Guamanga project and 100% of the La Serena project. - Hole PTDD101 identifies multiple high grade silver and lead zones"
"We are very encouraged by these positive copper and gold results from Guamanga. Our goal was to confirm and extend the existing zones of near-surface copper and gold mineralisation and we have successfully achieved this objective. The grades and widths seen close to surface are a positive outcome for us". "At our Paguanta Project, it is also great to see high grade assay results continuing to flow. What is particularly pleasing is the high zinc, silver and lead assay grades returned from PTDD109 over mining widths favourable for mechanised mining/stoping (in this case 6 to 7m down hole widths). This hole is located in one of the deeper parts of the current resource and is one of the deepest holes drilled into the Cathedral Vein. The Cathedral Vein now extends from surface to depths in excess of 250m. We believe the high grades achieved in hole PTDD109 bode well for the potential for future high grade extensions at Patricia - a theme we keep coming back to given the speculation regarding the potential future supply outlook for zinc." “It is a very large IP [induced polarisation] anomaly and we’ve drilled only the north-west corner of it. The majority of the geophysical anomaly has not been drill-tested and where it has been we’ve just got multiple high grade veins that are open along strike and down dip." Then in may the company released its full year results which outlined in detail its plans for the rest of the year which included its focusing of interest into the 'Paulina' zone in the Guamanga area where further good drill intersections were encountered. Also in the results a loss of £2.55m was noted, up from a loss of £1.05m in 2010. Despite the company's limited cash flow as of MAY, a list of objectives that could be achieved with the remaining cash was listed as found on page 4 of the Annual report. Interestingly the company was seeking new project opportunities in Chile. Whilst this is indicative they wish to grow the company I believe that Herencia would be better off focusing on its existing assets due to its limited cash balances and high prospectivity that has not yet been unlocked within existing assets. Total asset value also exceeds the current market cap with a value of £18.7m up from £13.2m a year before. The next set of decisive news following a Paguanta update in mid-June was that of mineral resource estimates for the Paguanta project in late June. A 244% rise in resource estimates and a 29% increase in total resource tonnes further prove the progress being made in Paguanta. It was also restated that the Patricia mineralisation remains open in all directions - emphasising the progressively expanding nature of the Patricia zone. Perhaps the only major disappointment of the year came in July when a placing was completed for 150m shares at 0.8p to raise £1.2m. For such a small amount of money in the scheme of things, the discount was atrocious and rightly the share price dropped heavily. Dubiously it was the directors and Nystar who took up a fair chunk of the placed shares who aggregately bought ~26m shares - a sixth of the entire placement. The money was partly used to continue surface geological mapping and continue the Induced polarisation survey on the Patricia anomaly. The feasibility study will still be added to up until completion. Despite the previously encouraging results, the most encouraging came today (22/08/12) with the first assays from the Patricia deposit were described as 'excellent'. Most importantly, the results support the view shares in early 2012 that it can be used as an open-pit mine (due to close to surface deposits of primarily very high grade silver (at best so far 1015ppm)) which has significant benefits not least cheaper exploitation which is important for a small-cash strapped company. However, only 15% of the results have been returned with the remainder to be returned over the coming 8-10 weeks. Should further 'excellent' results be uncovered there is scope for an aggregately large rise in the share price. The next 8-10 weeks will be a share price defining moment for the company and will inevitably catch the eye of many investors. The upside potential here is significant to say the least but of course its dependent on the coming results from Patricia. Nevertheless today's results represent a significant milestone into understanding the close-to-surface promise that is held at Paguanta. The clear problem with Herencia is the raising of funds. The very large discount the last funds were raised at could be a precursor to the next fundraising although if further good results can be attained, this may help dissolve the discount to the share price. One problem that will affect Herencia in coming years is that of infrastructure close to Patricia. Should the Patricia zone become prolific, roads through the Tarapaca valley amongst other necessities would have to be constructed bearing a fairly large cost that would run into several million pounds. Of course, by this point Herencia may have farmed in a larger company to help pay for the costs/give them a free carry, but it is far too early to discuss such things. A major positive for Herencia is that its in country with solid governance, something that is atypical of South American countries. Chile also has a strong mining background which reduces any sort of governmental risks as commodities compose a very large proportion of total exports. If Herencia can secure the funding it needs, it looks a very good bet hence I have a personal buy tag on it. The next couple of months and the Patricia results could be the recovery catalyst to get Herencia back on track. Hope future articles provide useful!